Getting a good suit made can be tough in this city, especially if you’re someone who’s very finicky about fabrics and fittings (no one likes a sloppy suit). That’s why we asked eight men with exceedingly dapper suits about their go-to tailors so you could have a tried-and-tested list for the next time you need to get a suit (or anything else) stitched. Brij Anand, a business owner, swears by Varun Kumar’s work. He’s been going to him for years now, and gets his suits and bandhgalas both stitched by him. He tells us Varun has an excellent range of fabrics and does structured cuts right. His floral designs are really nice – we recommend you give those a chance the next time you want an offbeat bandhgala. His delivery time ranges between 4-7 days, and once he gives you a date, you can be sure it’ll reach you by then. He even has a Facebook page, so you can check out his work beforehand. Regardless, you can be sure your fitting and finish will be excellent. Nikhil Kamath, food writer, says that these guys make really good quality suits at wholesale rates. He’s been going to them since 2005, and he claims their quality has only improved over time. They do a great job of working from references – show them something you want to replicate, and it’ll be done. You can tell them if you want a suit for a formal occasion, wedding or party – they’ll make you one accordingly. They also have ready-made suits that they can alter as per your requirements – these don’t take much time (three to five days at best), but stitching a suit from scratch usually takes a week. Sanat Bathla, lawyer, has been going to the tailors at Viavero for a while now. They’re based out of Malviya Nagar and he claims they’re absolute whizzes with fabric who will give you exactly what you have in mind – or possibly something better. He tells us they have a vast selection of fabrics, and they ensure the fitting is snug without lots of trials. They take some time with their delivery (around 15 days), but we hear its worth the wait. Make sure you go well in advance for your fittings. You can check out their website here. Bakul Sachdeva, business owner, goes to Incheetape in Shahpur Jat for their unique designs and their high-quality fabrics. If you’re looking for something that stands out (but isn’t loud or bling-y), these guys have some really nice stuff. For the kind of fabrics they use and the designs create for you, the price you pay will be worth it. They usually deliver in 7-10 days. Rahul Bhawnani, Community Engagement Manager, goes to them quite often for tuxedos and suits. They’re a little difficult to find, so calling them for directions when you’re close by might be a good idea. They’ll replicate any suit you want, and ensure you get a really good fit. They’re quick, reliable and get the job done without much fuss. They usually take 10-15 days to deliver. They have plenty of really nice options for fabrics, so you’ll have lots of choices. Uday Bajaj, Student, recommended them to us. These guys have something for everyone – whether you want something more simple or more snazzy – they do it all. They ensure the fit is great and have tons of interesting designs and fabrics to pick from, all at reasonable rates. They usually deliver within 7-10 days. Mayank Gautam, Data Quality Analyst, recommended them to us. 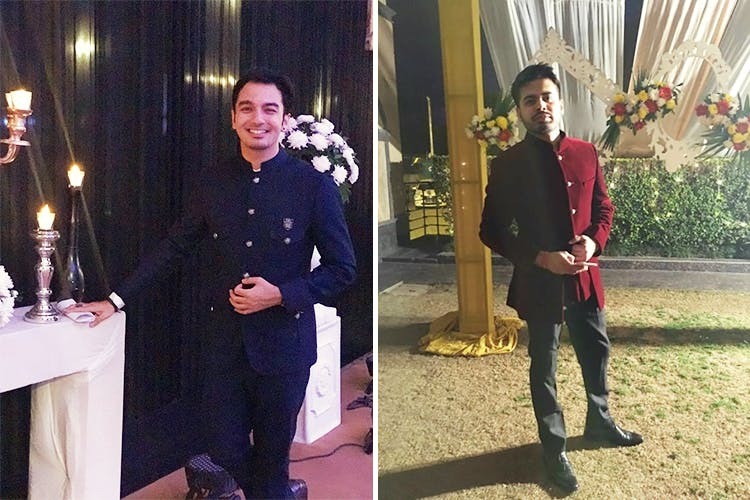 Though you can shop from the online, it’s best to go to their store and get a customised suit made – Mayank tells us they’re really good at what they do. We hear they even help you decide on the footwear and accessories to complete your look (in addition to ensuring that your suit is perfectly fitted and just how you want it). They’re very passionate about what they do and it obviously reflects in their work. They deliver in approximately 5-10 days, depending on what you’re getting stitched. Mukul Rautela, Photographer, recommends Collar in Meherchand. Besides being one of the few places that uses imported Italian fabrics, they also work with materials like Benarasi fabric, handlooms, linens and linen mixes, wool, cotton, silk and even block-printed pure cashmere. Collar also stocks up on different kinds of prints, so whether you’re a solid neutrals and classics kinda guy, or the ever-experimental type, this boutique has something to suit everyone’s tastes. They offer a variety of buttons, like antique-looking monograms and plain metallic ones, but they recommend the mother of pearl buttons that may seem a little dressy, but look extremely smart. They take approximately two weeks to get your suit ready. Price: INR 15,000 upwards for a suit, and INR 18,000 for a bandhgala.